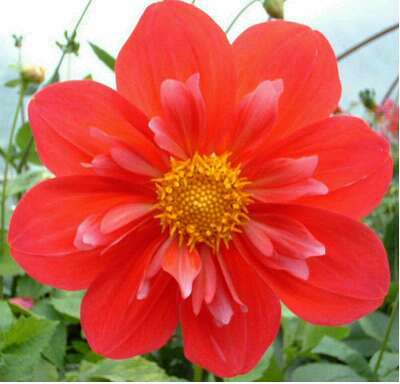 season or late flowering varieties, so that the best stopping dates are used). 3). The percentage of seedlings to form true collerettes. 5). Eccentricities � double blooms etc. 6). The percentage that have excess petals. 7). The percentage to reach first flower relative to the number of seeds planted. possible. So a different set of pollinators visits the uncovered plants. 1). SUE MOUNTJOY which was located in the tunnel. Seedling numbers preceded by C (for Covered). The seed parent is not known. Deep red and unusual pink collar. 2). 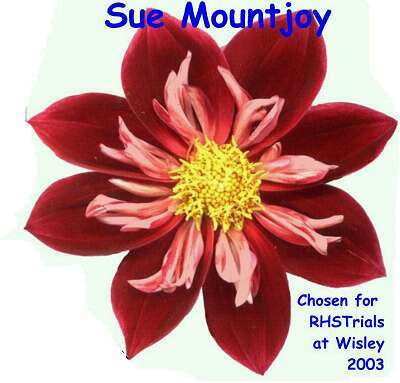 SUE MOUNTJOY which was grown in the open. Seedling numbers preceded by U (for Uncovered). Named after a friend from Bickleigh, Devon. In the winning set of the NDS collerette championship, 2002. 3). DEMI SCHNEIDER. Seed parent � Sue Mountjoy. Will good attributes be passed on or poor ones persist? This variety has a very vibrant colour. Seedling numbers preceded by S.
Demi Schneider was one of the varieties which won the NDS collerette championships in 2003 and 2004 and has been selected for trial at Wisley in 2005. Named after my elder daughter. 4). 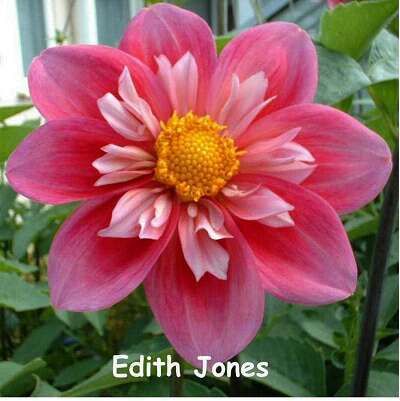 EDITH JONES. Seed parent � Sue Mountjoy. Will its excessive height persist in the seedlings? 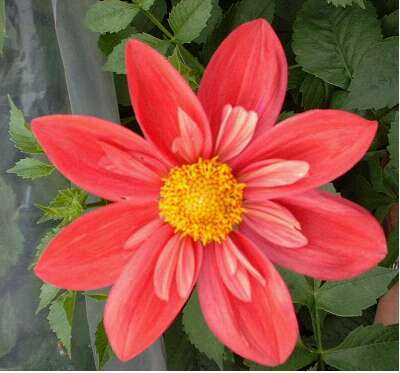 This variety has distinctive colouring � a red blush on pink. Seedling numbers preceded by J. Named after my 87 year old mother-in-law. 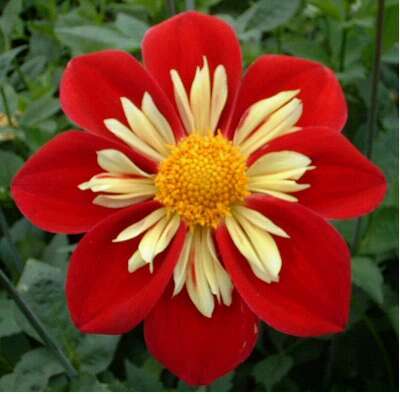 One of the varieties in the winning entry of the NDS collerette championship in 2003. 5). JACQUIE HURST. Seed parent � Sue Mountjoy. Will it pass on its classic form? Seedling numbers are preceded by H.
One of the varieties used in the winning entry of the NDS collerette championship in 2003. Named after a friend from Finchley, North London. 6). TEESBROOKE AUDREY. 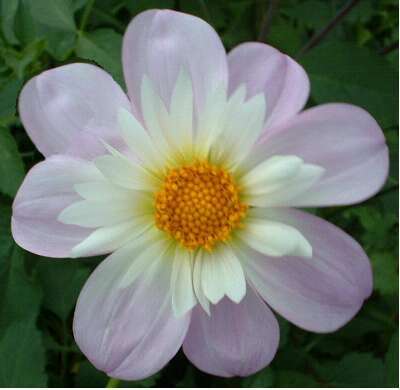 From Phil Orley, this variety is of delicate lilac and white blends. What effect will the pollen of my strongly coloured plants have? 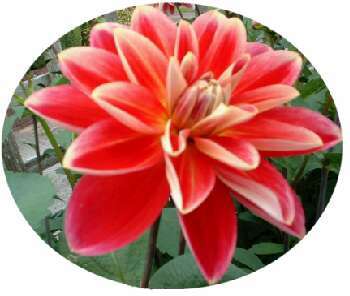 This variety forms a large very floriferous plant. Seedling numbers are preceded by A. This variety originates from the north east of England. Will the delicate pastel shades appear in any of this year�s seedlings? 7). DEE MORRELL. 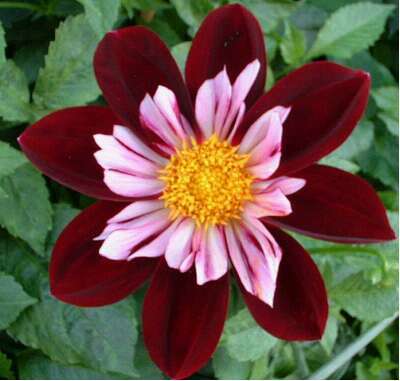 Seed parent � Maureen Kitchener (this is a waterlily dahlia which had a collerette parent). Dee Morrell is a very deep red with a pink and white collar. Unlike most IJK seedlings it is low growing. Will seedlings retain the intense colour? Seedling numbers preceded by M.
Won single vase class at Harrogate NDS National Show. Named after my next door neighbour. 8). PATRICIA. Of New Zealand origin this variety has an intense and eye-catching colour and large flowers. The stems therefore tend to bow in an arc so the flowers are set at a poor angle for exhibition. Its origin makes this one interesting and therefore worth testing. Seedling numbers preceded by P.